This blog entry about the events of Friday, July 01, 2011 was originally posted on July 16, 2011. PART 14 (DAY 16): “What’s your name?” asked the young new face of the mysterious little girl in front of me in the Flagstaff KOA. At 5:45 am, the kampground was already illuminated by the dawn’s early light, but it seemed we were the only two awake. She had come up to me so randomly — wearing no shoes — that it was a little surreal, and I wasn’t sure if I was awake and trying to work on my laptop, or still in the tent, having a weird dream. It was a little weird that Sissy was just talking to me, but I guess that’s the curious nature of kids. Obviously she hadn’t been taught not to talk to strangers. Fortunately she lucked out that I wasn’t a child molesting pervert, although anyone who didn’t know me, or know that I didn’t normally wear a creepy mustache, could have thought something was awry. Apparently Sissy was awake to look for the inflatable bouncing castle that was up the night before, and chat me up when she couldn’t find it. She talked to me about the things that four-year-olds do, like her Tinkerbell pajamas, and dogs, and birds, and bees — “flies that don’t have stingers” — until she noticed my computer. Just then there was the sound of Cheryl coughing from inside the tent. “Oh,” Sissy said, processing the information. “I have a lot of teeth! See!” She smiled to show off her teeth. We had small talk for a good half hour as the kampground started to wake up, and she went to find her family (they were just diagonally from us), but she came over later to excitedly tell me that she had pet a dog(!). She was a little confused that the coughing came from a girl and not a boy though. LIKE OUR JOURNEY FROM THE MOUNTAINS OF WYOMING to the desert of Salt Lake City, we descended again from the San Francisco peaks of Arizona to the desert of Scottsdale — the cooler, livable town adjacent to Phoenix. At a high of 114°F that day it wasn’t “cooler” in the temperature sense, but “cooler” in the fact that it’s where the cool kids of the area live, eat, and play — particularly two that Cheryl knew, one a transplant from greater New York City. So it was there we drove to at least have brunch with them. As fans of house music, New Yorker Jamine met Arizonan Niko at the Winter Music Fest in Miami, where the two hit it off and began an LDR (long distance relationship). Things went well and eventually Jamine traded in her life of the New York bar and club scene to live with Niko in the desert where, as they say, “at least it’s a dry heat.” Where she had moved to was definitely an upgrade with all the space in the house they lived in; for Cheryl and me, it was like getting the initial tour on MTV Cribs. There was a spacious foyer/den/living room with high ceilings, tastefully decorated in African art, paintings, a flowing indoor fountain, and a exorbitant amount of rhinocerous scupltures. The living room connected to a spacious kitchen with an island, and that led out to the backyard with an in-ground pool. Next to the pool was a bed in case anyone wanted to sleep outside. “It’s not like New York,” I commented. “It’s definitely not New York,” said Niko. Despite all these luxurious amenities of the home, the most impressive was not a piece of furniture, but their new puppy named Mr. Teddy — one that could do more tricks than I’ve ever seen a pup at only seventeen weeks old do. Jamine and Niko reciprocated enthusiasm when we told them all about what we’d done on our road trip thus far: dinner in Chicago, staying at a lake house in Minnesota, camping in Badlands, seeing Mount Rushmore, camping in Yellowstone, climbing in Tetons, doing the Mormon tour in SLC, Arches, Canyonlands, Four Corners, Monument Valley, and the Grand Canyon. “You guys must be having a blast,” Niko said to us. “I feel like we should take you somewhere cool too.” Jamine the former New Yorker suggested the Old Town after brunch, since we had limited time. AFTER EATING AT THE “BREAKFAST JOYNT,” one of Niko and Jamine’s go-to brunch places located a drive away in an Arizona strip mall, we hopped in the A/C’d car and toured the Old Town, where the remnants of the original old western town Orangdale had been fortified and repurposed to be touristy cafes, galleries, and shops — while still retaining an Old West motif and charm. “Nah,” Jamine answered, having been able to make the true comparison. “But New York pizza is a thing here.” Looking around, we saw that it was more than pizza that had become a thing from Italians — or Italian-Americans. It appeared that Jamine had certainly carved a nice life for herself with Niko; the two of them had the best of both worlds, which translated into their clash of social circles; they debated if they should mix two groups of friends for a gathering: their dog-owning friends who have doggie happy hours, and their stripper and underground house music friends. Perhaps that duality was everywhere in Scotsdale; I thought it was weird that there were palm trees juxtaposed with cowboy paraphernalia — although some perfectly kitsch. Before leaving Scotsdale, we made a quick round around Old Town, checking out the shops and this one gallery where Niko asked about this one rhino sculpture, of course. Under the desert heat, there are misters everywhere to spritz down for a moment, not that the cacti need it because there’s no shortage of them — especially since there’s a store called the Cactus Hut in case you ever run out. “Thanks for stopping by!” We bid our farewells to the couple after a brief but well-worth time together. For both Cheryl and I it was nice to catch up with the face of an old friend, and meet her new other half, but we had to continue on to meet another old face (at least for me and readers of this blog) in California. “LOOK AT THIS. THERE’S LANES. And cars. I don’t know if I can drive this,” Cheryl joked. Crossing into the state of California via interstate I-10 — and into the Pacific Time Zone (not that it mattered because Arizona doesn’t follow Daylight Savings Time) — was an anti-climactic affair. I was expecting there to be a big billboard saying “Welcome to California!! !” with pictures of suns and oranges and surfboards and maybe redwood trees or even tacos, but the small sign was rather ordinary. Unlike any state border crossing thus far, this one came with an agricultural checkpoint, where you must declare fruits or vegetables from other states since the California biosphere is so special I guess — although you would never know with all the misty marine layer fog everywhere. Entering California was in fact a big deal though, not only because we finally got consistent 3G coverage on our cell phones, but because it was our final state after all. However, we still had to traverse it and then head back northbound from our southern scenic detour to get to the bay area. That would be too long of a drive, so we embraced the inevitable with a night layover in L.A.
There’s no need for introductions of the USA’s 31st state; everyone in the world knows California from television, movies, and every other song that the Red Hot Chili Peppers performs. 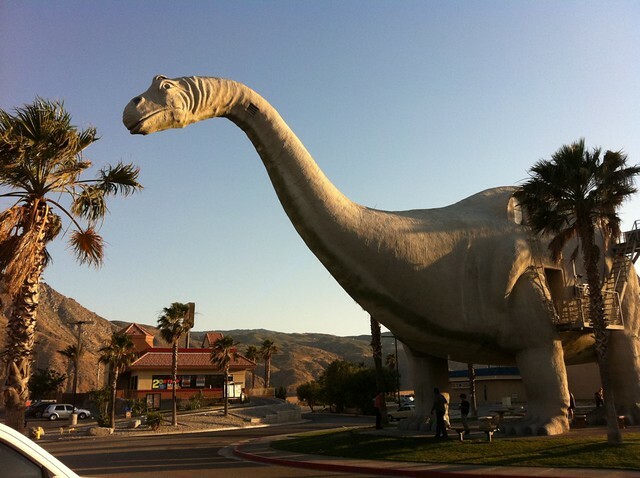 Just driving along I-10 West (the Sonny Bono Memorial Freeway), the pop culture references began: signs for Coachella, home of the big music festival; CHiPs, the California Highway Patrol that was made famous by that 70s show with Erik Estrada; and the dinosaurs of Cabazon where we made a necessary (for me) stop at — it’s most famous for being the dinosaur diner/park in Pee Wee’s Big Adventure. Cheryl’s GPS device got us a little confused on how to get to our destination in L.A. County, but perhaps that’s because the roads in California often don’t make sense; you have to backtrack sometimes on another road to go forward on the route you were going. Thankfully, we had some human directions — from the person we visited and stayed with that night. “Hello!” I greeted Noelle, the long-time reader whom I met in Thailand (and Cambodia after) because of this blog. (This cameo would be her second appearance on it.) She handed me a residential parking tag to hang on the rearview mirror so we could park right across the street from her apartment in Hermosa Beach, just two blocks away from the Pacific. “Erik is traveling with a backpack? !” she joked, knowing my travel style, as I moved some of my belongings inside. Cheryl and I arrived just after nine, as nightfall began. After a quick refresh, the three of us were all of a sudden in a taxi, where as if on cue, the cabbie was appropriately blasting “California Love,” by west coast rappers 2Pac and Dr. Dre to welcome us. We rode not far to neighboring Manhattan Beach, which has a beachy L.A. nightlife to it, for dinner and drinks. “You can tell you’re in Manhattan Beach when eight girls show up, and one of them is not blonde,” Noelle explained. Joining us at Simmzy’s gastropub was Noelle’s friend Eric, whom I couldn’t help but noticed looked a bit like comedian Louis C.K. However I was mostly concerned with not being in the car for a change — or a campground for that matter — sipping on a beer with friends old and new, and being where we were. “We’re in California, Cheryl!” I announced as we high-fived. Noelle and I reminisced about that perilous night getting to Siem Reap in Cambodia when we thought we might be kidnapped or killed, as Cheryl and I shared a couple of plates. We eventually left Noelle and Eric to rest up back at the apartment; it was a long day after all and falling asleep was no problem. Although it was too dark to see that evening, we were just two blocks shy of the Pacific Ocean — the end game of the “sea to shining sea” stunt since we’d left from the Atlantic. But daybreak would reveal our manifest destiny, for our final leg of the road trip. These will finally come to an end! Sorry for the piecemeal! It’s been crazy busy back in NYC. YAY!!! I’m back on the blog!! Hahahaha. :D Glad I could give you guys a spot to sleep, not in a tent.